In addition to SCH40 and SDR35 pipe and fittings we stock ADS N-12, ADS fittings, corrugated tubing, and a healthy selection of Fernco flexible couplings. In our back yard you’ll find plenty of N-12 corrugated dual wall pipe, along with ADS fittings, 4″ and 6″ corrugated tubing, and filter fabric. Call today to check stock. We’re pleased to carry a deep line of reliable Fernco flexible couplings for any and all sewer, waste, and drain piping. 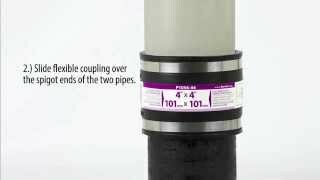 Affect quick repairs or join different sizes and materials with easy and confidence with these go-to sewer couplings. For a quick and easy connection you can count on. Ford’s Sewer Saddles are available for 4″ or 6″ branches on 6″ – 50″ sewer pipe.